Olava the Feeble's House is a small house in the southern part of Whiterun. It is located right behind Breezehome. It is the residence of elderly seer Olava the Feeble and consists of one area only, Olava the Feeble's House. 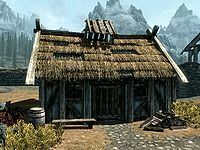 The house is among the smallest houses in Whiterun and contains very little of value, hence the "empty" shadowmark outside. The front door opens to a huge open fire with a cooking pot and some hanging Dried Elves Ear. 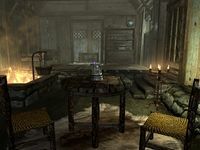 The table on the left holds a petty soul gem while the single shelf on the wall holds two soul gem fragments and the end table contains a few pieces of gold. To the right of the front door is Olava's owned bed and a cupboard with clutter. On the shelves above sits some food and, a coin purse, a book The Holds of Skyrim, and a sack with food or Salt. The small alcove to the west has a chest with some gold and pelts, an eidar cheese wedge and a sliced goat cheese. On the adjacent shelves, above the two food barrels, sits a sample of tundra cotton, a potion of enhanced stamina, a potion of brief invisibility and a bottle of wine.